Spice up your cooking life! Don't let yourself be limited with traditional styles of preparing dishes at home. Try the vacuum-sealed, water immersion method and let your family enjoy a restaurant-like dining experience. EuroChef is offering a Sous Vide Immersion Cooker to help you make this a reality. New to this cooking method? There's nothing to worry as this slow cooker has user friendly touch screen digital controls that will allow you to achieve precision cooking at the comfort of your own home. With an adjustable timer and cooking temperature settings of up to 90 degrees, it will surely help you ready perfectly cooked, healthy and mouth-watering meals without a sweat. 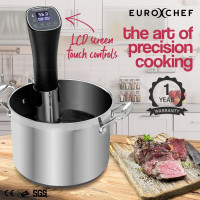 EuroChef Sous Vide Immersion Cooker is designed with a smooth quiet operation feature so you can sleep well and be confident that a juicy, flavorful and evenly cooked steak will be waiting for you when you wake up. What’s more? 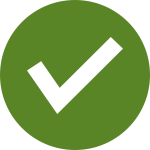 With this unique cooking method, you and your loved ones are assured that the nutrients and vitamins will be well-preserved in your food. Safety is not a problem since this slow cooker has a reliably strong stainless-steel clamp that you could use to secure it onto containers. As a bonus, EuroChef Sous Vide Immersion Cooker is energy efficient because it uses an 800-watt heater to ensure that the desired water temperature is reached in no time. Use this slow cooker with the Air Fryers, Soup Makers & Blenders, Meat Slicers and the other kitchen appliances offered by Mytopia. Level up your cooking experience. Try the Mytopia’s classy and durable line of appliances such as Deep Fryers, Food Dehydrators and Meat Grinders and be the talented cook that you can be. What are you waiting for? Avail the Eurochef Slow Cooker at a reasonable price and start serving gourmet dishes and gastronomic treats to your friends.